In Le Passé Composé, most verbs use avoir as the auxiliary verb but a fixed number of verbs use être instead. They are almost all verbs to do with movement (See Conjugate coming and going verbs (+ être) in Le Passé Composé (conversational past)), but also those to do with states of being (birth, death, becoming, staying). Marie, tu es restée avec Lucas hier. Marie, you stayed with Lucas yesterday. Il est mort l'année dernière. Nous sommes devenus bons amis. Vous êtes restées dans le train. You stayed on the train. Because they're using être as auxiliary verb, their past participles have to agree with the subject of the verb. Vous êtes restés mes petits garçons. You remained my little boys. Ils sont décédés le mois dernier. Participle form for "vous", and for "elles"
Vous can mean one person (polite ? ) form, or more than one person. So "vous (Gareth) êtes resté à la maison"; vous (Laura) êtes restée à la maison" and "vous (Laura and Aurélie) êtes restées à la maison" ? I'm making my best guesses here. Vous is not included in the lesson. And elles is not included in the lesson either. "Elles êtes restées à la maison"? Whether my versions are correct or not, lesson might be improved by adding examples with vous and elles. Thanks as ever. Bonjour Melody ! First of all, Bravo ! All your guesses for "vous" are perfectly correct :) As for "elles", almost -> "Elles SONT restées à la maison." And I agree with you that these cases need to be added to the lesson, which will all be done shortly. Merci beaucoup et à bientôt ! Aurélie Thanks for the speedy response. Sorry about the "brain glitch" on "Elles sont"! One last question- for "vous (Laura and Aurélie) êtes restées à la maison", is there a liason between the "s" at the end of "restées" and "à" ? (and other similar cases)? Thanks again. I find Q&A section SO helpful! Bonjour Melody ! In this case, most people wouldn't do the liaison between "restées" and "à", it sounds weird to me personally :) I would say that usually before "à la maison" I wouldn't do the liaison. 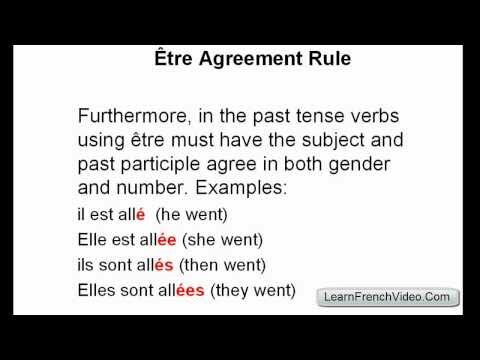 Following this question, I also decided to rework the lesson on agreement, and add a section about the "vous" agreement there ;) -> Agreeing past participle with subject's gender and number with (+ être) verbs in Le Passé Composé Merci et à bientôt ! what about using mort or né as an adjective? If you are saying the king is dead or the baby is born, can you use mort or né as an adjective, viz le roi est mort, Le bébé est né? Bonjour Jennifer, Yes, past participles of all verbs can be used as adjectives. I was caught out as I hadn't learnt that Décéder & Devenir are etre verbs in passe compose: they are not in the "traditional" group (and not in the house photo on Wikipedia). Are there any other rogue verbs that use etre? All the (+être) verbs are covered in our system in two lessons: this one (for 'rogue' verbs) and the "coming and going verbs" lesson (see https://progress.lawlessfrench.com/revision/grammar/conjugate-coming-and-going-verbs-etre-in-le-passe-compose-conversational-past). Yes, I noticed that too. In other French courses (& those 'mountain verb' diagrams) nobody tells you about décéder & devenir! What else might the cunning French be keeping from us? One of the test questions for this lesson is: Zoë est née avant Lèo. Zoë is born before Léo. Is this past tense translation correct because the speaker is necessarily speaking about a past event? Could we use the present tense here? Bonjour, It's a mistake, it should say "was born," or else, as you suggest, naître should be in the present tense. Bonjour John, Yes, it's definitely a translation error. If you used the present of "naître" in French, it would mean they're being born right now, or weirder, that they're born regularly ! You can use the present form in a general context, for example: "Tous les ans, des quintuplés naissent dans le monde." (Every year, quintuplets are born in the world.) The error has been fixed! Merci et à bientôt ! What about in a dramatic real time senario, eg the baby is born as the clock strikes midnight. Would the french be nait or est né?